Evergreen Landscaping Limited founder David Andrew has been working as a landscape gardener since 1988, at the age of 17, and running his own landscaping business since 1990. 28 years later, David has a vast wealth of garden maintenance and construction experience that he can utilise to bring out the very best in your garden. 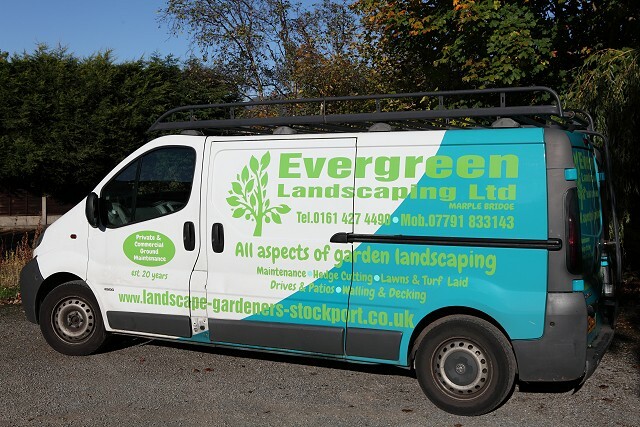 Evergreen's team of time-served staff are experienced in virtually all aspects of garden landscaping and can help you with garden designs and ideas as well as undertaking the installation for you. For larger jobs Evergreen can also project manage the whole works, bringing in specialist contractors where needed. Over the last 26 years Evergreen Landscaping has developed significant experience in every kind of landscaping works, including the building of driveways, paths, patios, retaining walls, raised beds and the laying of real turf or artificial lawns. In addition to this wide-ranging experience Evergreen has also become a specialist in the laying of Indian Stone and installation of AstroTurf and other makes of artificial grass. As a small business Evergreen Landscaping Ltd. Are able to keep overheads to a minimum and their rates are extremely competitive. So whether you need a new patio or decking, are planning a new landscape feature, or looking to carry out a complete garden makeover, please don't hesitate to call us today for a free, no obligation quotation.